Convert Apple Mail to PST with Mail Extractor Pro is hassle free. It will Auto Load your entire Apple Mail Database and convert into PST file format for Outlook for Mac & Windows. (Support Outlook 2016 / 2013 / 2011 / 2010 / 2007 / 2003 / Office 365). Mail Extractor Pro is designed to convert Apple Mail, Thunderbird, Postbox and MBOX to PST for Mac Outlook and Windows Outlook. Bug Fixes: Fixed a hang on exporting PST files. Bug Fixes: Fixed a bug in attachment handling. New feature: Added facility to converter Thunderbird/Postbox email database to PST files. Added option to convert MBOX file from source. Mail Extractor Pro - Convert Apple Mail, Thunderbird, Postbox & MBOX files to PST for Microsoft Outlook (both Mac & Windows) 2016/2011/2013/2010/2007/2003. Moving the emails stored locally in Apple Mail to a client that does not support the same data files of Apple Mail (MBOX) can be tedious. Users who have no technical skills regarding email migration find it even more troubling. Windows Outlook is a client that does not support the generic MBOX format. The native file format for Windows Outlook is PST (Personal storage table format). It is a proprietary and open file format by Microsoft. So that’s the crux of the situation. Apple Mail does not archive to PST, and Windows Outlook can only import PST. Since you can archive your emails and contacts to an MBOX file from Apple Mail, it makes sense to use a third party MBOX to PST file converter. And that’s what most users do. But there are countless issues with this method. First off, most of the converters are built wrongly without keeping some of the erratic behavior of both files in mind. These tools can often end up damaging your data. Secondly, it can take a lot of time. First, you need to archive the emails to MBOX files, then use the tool to convert them to PST. There are even more middle steps that I missed. Thirdly, these tools fail to convert data completely. There are two reasons for that. First, the algorithms used for conversion are inferior and can miss elements from the files in action. Second, the MBOX to PST conversion is itself hard to perform precisely because of its very nature. The data migration occurs between data files, not directly between the sources. So, if typical MBOX to PST converters have all these problems, what else can be done? 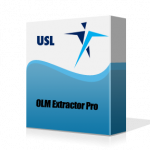 “Mail Extractor Pro” is an application built by USL Software to convert Apple Mail data directly from the source to PST files, instead of using MBOX files. Although, there is an option to manually load MBOX files like with conventional tools, it is just given as an option if ever needed. And lastly, it’s the interface that must be talked about. The hardest part for any developer building an email migration tool is to make an interface friendly. But USL here has succeeding in eliminating many manual steps and inputs and thus in process has simplified the interface dramatically. The UI of “Mail Extractor Pro” is extremely friendly and intuitive to use because of the basic design. This in no way limits the functionality. You get all the advanced and unique features without being overwhelmed by the cluttered interface. You can find the free trial setup at the link given below. Get your copy today. Click Here to download free copy of Mail Extractor Pro – Ultimate tool to convert Apple Mail to PST. Mail Extractor Pro helps you convert Apple Mail to PST in perfect way.